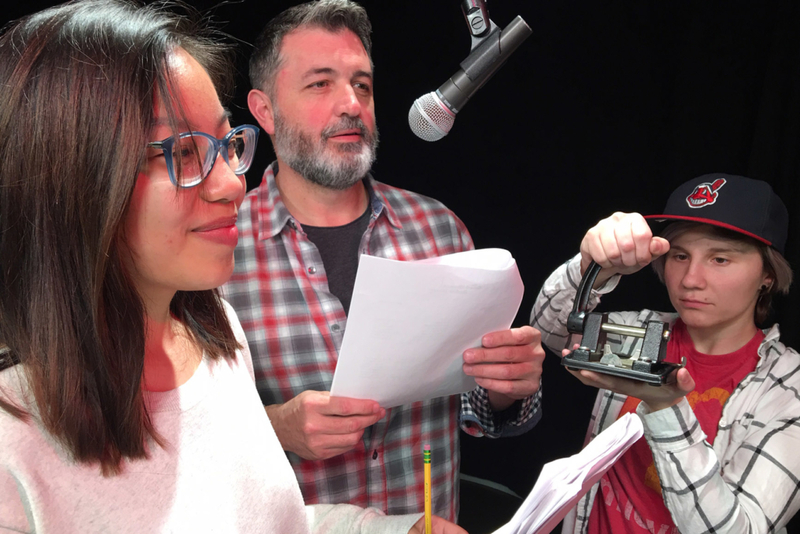 “L’Amour Noir” is the newest version of the popular radio drama series presented by the YSU Department of Communication’s Good Humor Radio Players, directed by Randall Brammer, part time faculty in the Department of Theatre and Dance. The next performances will be Tuesday and Wednesday, April 16 and 17 at 6:45 pm at Butler North, located adjacent to the Butler Institute of American Art, 524 Wick Ave, Youngstown, OH 44502. Doors will open at 6:30pm. The events are free, but tickets must be secured in advance by calling the University Theatre Box Office at 330-941-3105. Patrons are advised that some scripts contain adult language and themes. Tony Pepperoni lives a complicated life. He lives the busy life of a mob boss, does whatever he can to appease his demanding family, and secretly owns a pizzeria called “Saul Herskowitz’s Kosher Deli”. To help bolster sales, Pete’s Mom and Dad have come up with a new twist on the old family pierogi recipe to reach out to the more “health conscious” customers. Dr. Dasia has a lot of “difficult” patients to take care of, and she’s losing her patience. Johnny Raven has a foot in two worlds; one in the Loop and one out of the Loop. The Good Humor Radio Players is an audio theater production and performance company comprised of actors, Foley artists, sound engineers and musicians, including students and community members from the Youngstown area. The performances feature live actors on old-time radio microphones including live sound effects and music as a selection of dramatic tales for the ear are told. Audio theater is referred to as “theater for your mind.” During the 1930s and 1940s, American radio networks perfected the radio drama through a variety of half-hour productions such as Inner Sanctum, Fibber McGee and Molly, The Shadow, and The Lone Ranger. Limited free parking is available in the Butler’s parking lot, and additional parking in the Wick Avenue M30 deck is also available for a nominal fee. More information is available by calling the Office of Community Engagement and Events at 330-941-2307.